Freechoice: Discover the charms of Auvers-sur-Oise and see Vincent van Gogh’s room, or step inside the magnificent Chantilly Castle for a guided tour of this remarkable château, set amid beautiful parklands. Freechoice: Enjoy a walking tour of Rouen, the capital of the Normandy region. Take in the famous sites of Joan of Arc and the historic Rouen Cathedral. Walk the winding medieval laneways and admire the city’s half-timbered houses. Alternatively, join a guided cycling tour along the Seine River to the beautiful 19th century botanical gardens that boast a number of exotic and rare plants. Freechoice: Visit Giverny and Monet’s former residence and gardens. Admire the beauty of the landscape as you walk the paths exploding with colour and life. Or, if you’re feeling more adventurous, you can explore by bike, with a self-guided cycling tour. Freechoice: Shop with a Chef when you visit one of Paris’ local food markets and enjoy exquisite tastings, or walk the city with a resident expert and hear tales that only the locals know. Alternatively, you may wish to explore beyond Paris and tour the 17th century estate of Château Vaux-le-Vicomte, Louis XIV’s inspiration for the Palace of Versailles. Freechoice: This afternoon discover the Carriages Museum in the enchanting Bourg Castle, including a walk through the 16th century passageway to the guards rooms and immense WWII oil tanks. Alternatively visit Serisier Estate, constructed in the early 16th century, and learn the fascinating history of the estate while sampling some of the extraordinary wines produced on site. From Paris to Bordeaux, take in the beauty of France over 15 days on this luxury river cruise across three rivers. Visit wineries and soak up the history. 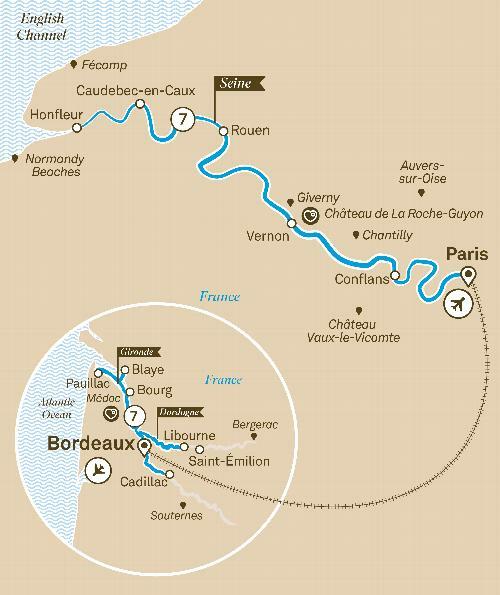 See the highlights of the River Seine and the Bordeaux region on this compact 15 day journey along two of France’s most iconic waterways. Cruise in luxury on board your Scenic Space-Ship and admire the picturesque landscapes from the comfort of your Scenic Sun Lounge or the Sun Deck. Scenic Gem will take you from the glittering lights of Paris all the way to the English Channel, while Scenic Diamond, featuring a unique Salt Therapy Lounge and bespoke Scenic Culinaire cooking experience, is the most innovative vessel to navigate the waterways of the Bordeaux region.